Kevin Tsujihara was named CEO of Warner Bros. Entertainment on Monday, stunning Hollywood given that he was viewed as the dark-horse candidate for the top job at the studio. 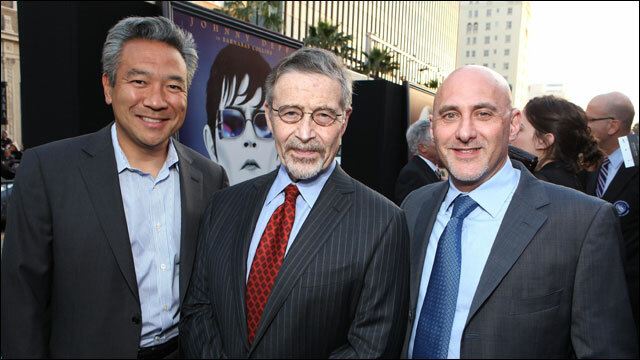 As chief of the studio’s homevideo division, Tsujihara had been seen as something of a long shot in a three-way battle with Warner Bros. Picture Group president Jeff Robinov and Warner Bros. TV Group president Bruce Rosenblum to succeed Barry Meyer, who will remain chairman through 2013. Tsujihara told Variety that he’s very much hoping that Robinov and Rosenbloom remain in their posts in order to maintain stability at Warner Bros. — a theme that was emphasized in recent conversations with Meyer and Time Warner chairman-CEO Jeff Bewkes. “In each conversation, we agreed that we don’t want to change the culture at Warner Bros. — not just for the management team but also the creative community and our partners such as Village Roadshow, Legendary and Alcon,” Tsujihara said. The ascension of Tsujihara, who starts March 1, will likely be seen as underscoring the importance of digital media for the future of the studio even though it isn’t currently a big revenue generator. A 20-year WB veteran, Tsujihara had been seen as the most progressive of the execs given the immersion of his division in new business models. Tsujihara, 48, has been president of Warner Bros. Home Entertainment since 2005. While principally charged with managing the studio’s DVD business, he has a broad portfolio of responsibilities that encompass pretty much everything that isn’t part of the TV or movie fiefdoms. That’s included the still-nascent business of digital distribution as well as videogames, technical operations and piracy. The race for the WB CEO job has been perhaps Hollywood’s most keenly followed, with speculation constantly swirling about shifting fortunes for the various candidates as they did best their not to look as if they were openly lobbying for the position. Under Tsujihara’s leadership, WB has been an aggressive player in digital distribution on a number of fronts. The studio played a leading role last year in the launch of Ultraviolet, a format backed across a consortium of industries that enables cloud-based distribution of content to a wide array of devices. While Ultraviolet is far from a success story after one year on the market, amassing over 7 million accounts, the technology is seen as Hollywood’s best hope for encouraging purchasing of films and TV series, as opposed to lower-margin but more popular rental options. Tsujihara’s ascension will open up the top post at his homevid unit. While it remains to be seen whether he restructures the portfolio he’s leaving behind, Ron Sanders, president of Warner Home Video, to step up. Or, in keeping with the growing importance of digital at Warners, Tsujihara could end up handing the reins to Thomas Gewecke, president of Warner Bros. Digital Distribution. Insiders add that a Robinov jump to Universal is by no means a certainty because many feel his internal management skills are what lost him the top job at Warner Bros. and would also be a factor if Universal considered him for Meyer’s job. Further out, the studio’s planning on a “Justice League” tentpole — presenting DC Comics characters Superman, Batman, Wonder Woman, the Flash and the Green Lantern — on the order of Marvel’s “The Avengers.” Will Beall is scripting, but no director has been attached. Robinov, a former talent agent, has maintained a strong filmmaker roster with first-look deals with Snyder, Ben Affleck (“Argo”), Todd Phillips (“The Hangover”), Robert and Susan Downey, Bradley Cooper, Tom Hardy, Clint Eastwood and “Harry Potter” producer David Heyman. The studio has three dozen first-look deals, more than any other. Robinov is responsible for more than $2 billion in annual spending on production and marketing and has a solid relationship with the affable Tsujihara. It’s widely known that Robinov and Rosenblum have a chilly relationship, and it was believed that Robinov might have departed had Rosenblum become CEO. Tsujihara was in charge of the negotiations over “The Hobbit” with MGM in 2010, leading to the start of production of Peter Jackson’s trilogy, which carries a pricetag in the range of $600 million. “The Hobbit: An Unexpected Journey” has performed well, with worldwide grosses of over $940 million. Oct. 2005: Tsujihara named head of a newly formed Warner Bros. Home Entertainment Group, combining the studio’s physical and digital businesses. Similar reorgs at other studios follow. Aug. 2006: WBHEG and film studio co-launch Warner Premiere, a direct-to-DVD unit including franchise iterations of “Free Willy” and “Ace Ventura.” Business found a niche for low-cost films until unit was folded last August, a casualty of the DVD biz decline. Dec. 2006: Warners takes $100 million stake in Sci/Eidos, keying a spree of videogame-publisher acquisitions that establishes the studio as a leader in the category. Jan. 2008: Warners abandons HD DVD for Blu-Ray, effectively ending a format war that caused confusion in the marketplace. May 2011: Studio acquires Flixster for $75 million. The film-centric social network has been positioned as a fan-friendly storefront for Ultraviolet.